Nuclear power investments require an adequate, certain, and long-term source of revenue. 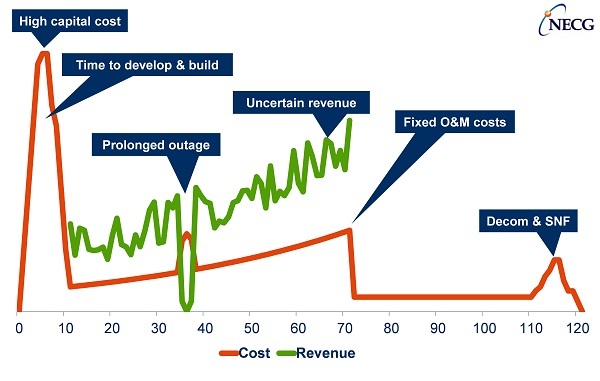 In the past, revenue certainty came from traditional government/regulated electricity models. In liberalized electricity markets, other approaches for revenue certainty are required. My 4 February 2015 WNN editorial was about the uncertain revenue in liberalized electricity market that make these markets incompatible with nuclear power. This Commentary is about ways to enhance revenue certainty in liberalized electricity markets. The electricity industry has a high degree of integration between power generation and retail electricity supply. Vertical integration and government ownership or economic regulation of the integrated electricity companies provide revenue certainty that supports power plant investments. Electricity restructuring typically involved de-integration, creating independent generators that were to compete in wholesale electricity markets. In the restructured electricity industry, contracts and wholesale power market transaction replace vertical integration. Power contracts can be used to increase revenue certainty. Power contracts can take several forms. Pseudo-ownership contracts require the buyer of power to take a share of power generated and to pay a share of costs incurred. These power contracts can place the buyer of power in an economic position similar to owning a share of the power plant. The Entergy subsidiary System Energy Resources Inc. (SERI) owns 90% of the Grand Gulf nuclear power station. SERI’s customers are other Entergy subsidiaries, including Entergy Arkansas, Entergy Louisiana, Entergy Mississippi, and Entergy New Orleans, which buy power under pseudo-ownership wholesale power contracts. The Vogtle 3&4 nuclear power plant now under construction in Georgia is partly owned (about 54%) by public power entities, including the Municipal Electricity Association of Georgia (MEAG). MEAG has entered into pseudo-ownership power contracts with its member municipal utilities. A simple power purchase contract has a single price (e.g., in $/MWh) that links generator revenue to the amount of power sold. Such contracts may require the buyer to take all output and usually limit or prohibit the buyer from dispatching or curtailing power plant operation. More complex power purchase contracts have a two-part price, with fixed payments (i.e., $/MW/year) and variable payments (i.e., $/MWh). If the pricing is done well (i.e., fixed payments are linked to fixed costs and variable payments are linked to short-run marginal costs), this two-price approach can un-link power project output from net revenue. Such contracts, unlike single-price contracts, allow the buyer of power to dispatch or curtail the power plant based on the variable payments. Selecting a power purchase agreement for a nuclear power plant will involve a careful assessment of how the contract will work in actual operation. Depending on the details of the electricity market, physical power purchase agreements may or may not be allowed. In so-called net pools (or balancing markets), users of power enter into contracts with generators for most of their power needs. The “market” is only for power that is bought or sold because power contracts do not exactly match load. In so-called gross pools, all power must be sold to and bought from the market operator. In these markets, power contracts are financial hedges settled on the electricity market spot price. These hedge agreements may work like conventional power purchase agreements, but have the flexibility to take many different forms. Hedge agreements are typically based on ISDA (International Swaps and Derivatives Association) templates used in financial and commodity markets. An example of an electricity hedge agreement is the contract for differences (CfD) that has been used in some electricity industry applications (e.g., the UK Hinkley Point C project). A CfD is actually two hedge contacts, a cap contract and a floor contract, combined into a single agreement and having the same strike price. One party to the CfD, a net seller into the electricity market, agrees to pay the other party the difference between the electricity market price and the strike price when the electricity market price is above the strike price. This is a cap contract. A CfD means that the volume of power covered by the CfD is bought and sold at the strike price rather than the electricity market price. This provides stable prices to both party. A collar contract is similar to a CfD, but with different strike prices for the cap and floor component. In a collar contract, both parties receive the market price when electricity market prices are above the floor strike price but below the cap strike price. Anyone can enter into a hedge agreement, but there are large risks if the hedge is not covered (e.g., owning a generator that sells into the market). A party with uncovered hedge contract exposure will require significant security or guarantees due to the risk of default. Power contracts, whether PPAs or hedge agreements, can provide options that may not easily be achieved under vertical integration. Contracts can place performance incentives on generators, may have shorter periods than the life of the asset, and increase flexibility compared to ownership. A single large generator might enter into a series of contracts with multiple electricity users or vice versa. Several examples are discussed here. Teollisuuden Voima Oy (TVO), an electricity producer organized under the Finnish Mankala rules, provides its members with a physical hedge in the Nordpool electricity market. TVO’s shareholders receive electricity at cost from nuclear power plants proportional to their ownership shares. The plant owners are a mix of municipal utilities and heavy industry with base-load demand, including forest product companies and municipal utilities. The output of the nuclear power plant is effectively contracted to each owner over the life of the plant at cost, providing the benefit of vertical integration to the TVO shareholders and providing revenue certainty to support TVO’s nuclear power plant investments. These arrangements provide a way to obtain the benefits of vertical integration. A generator can obtain revenue certainty by signing contracts with regulated electricity suppliers that are approved by the utility regulator. Duane Arnold – The Duane Arnold nuclear power plant in Iowa sold to NextEra Energy in 2005, including a power contract that expired until Feb 2014 when the unit’s original NRC operating license expired. The Duane Arnold power plant received NRC approval in late 2010 to operate until Feb 2034. In 2013, the Iowa Utilities Board allowed Interstate Power & Light (IP&L) to amend and extend the long-term power contract with Duane Arnold to cover an additional 12 years, with costs included in IP&Ls rates using an Energy Adjustment Clause. The state economic regulator approved the contract as a part of the IP&L rate case because it provides fuel diversity and cost stability, is a unique carbon-free generation asset, creates economic benefits, contributes to reliability, and is vital to the regional transmission system. Vermont Yankee and Kewaunee – These units, like Duane Arnold, had power purchase agreements that expired. Despite having NRC approval to operate for another 20 years, neither unit was able to negotiate power contracts that would provide adequate revenue for continued operation and both units were retired early. Maryland and New Jersey – State utility regulators in Maryland and New Jersey, concerned about new generation capacity investments in Maryland and New Jersey, required the regulated electricity supply companies in each state to enter into long-term power purchase agreements that would support new power plant investments. In both states, lawsuits were filed that successfully stopped the power contract requirements because the state regulators were encroaching on interstate power markets, over which the U.S. Federal Energy Regulatory Commission (FERC) has jurisdiction. Ohio – The Ohio utility regulator is considering proposals from several companies with unregulated generation subsidiaries including nuclear power plants. These proposals would put power contracts in place between the unregulated generation companies and their regulated retail electricity supplier affiliates. The contracts, like a CfD, would provide revenue to the generators when electricity market prices are low and provide benefits to electricity consumers when electricity market prices are high. The contract costs or benefits would be applied in a non-bypassable charge (called a rider in Ohio) to customers. Some have referred to this as a way for electricity customers to “invest” in the power plants. Others consider this a return to vertical integration and economic regulation of the generators. New York – The New York utility regulator is facilitating a negotiation between the Ginna nuclear power plant and a regulated retail electricity provider. The process is aimed at a power contract that will provide revenue to support the continued operation of Ginna, with this revenue recovered by the regulated retail electricity company in rates. Illinois – The Illinois legislature and utility regulator are considering approaches to provide revenue certainty for multiple nuclear power plants in the state. A report on this effort was prepared by Illinois State agencies. Ontario – In Ontario, the provincial government has taken a role in determining the mix of generation in the Ontario electricity market. Government-owned Ontario Power Generation owns and operates the Pickering and Darlington nuclear power plants that remain regulated. The Ontario Power Authority, now merged with the Independent Electricity System Operator (IESO), has contracts with Bruce Power, the private operator of the Bruce Nuclear power plant, which provide a certain level of revenue similar to a floor contract. UK – The CfD for the Hinkley Point C project has the project as one party and a new not-for-profit UK government entity acting as the counterparty. The new CfD counterparty will recover costs or distribute benefits to the licensed electricity suppliers in the UK. In effect, the nuclear CfD costs/benefits will be treated like regulated non-bypassable transmission and distribution charges. South Africa – South Africa has been considering a large investment in new nuclear power plants. The details are not final, but public reports suggest that this may be done with one or more new special purpose companies that will build, own, and operate the new nuclear power plants. These new nuclear companies would sell power to the national electric utility, Eskom, under long-term power purchase agreements that are supported by the government. Turkey – Turkey’s nuclear projects, including the Akkuyu and Sinop projects, involve a nuclear power plant that will be built, owned and operated (BOO) by a company that is not a participant in the Turkish electricity industry. The Turkish government is providing power contracts with government utilities for some of the output of the nuclear projects for some period. Japan – Japan is considering approaches to keep nuclear power plants financially viable after implementing electricity market reforms, in order to ensure long-term electricity supply and stable customer electricity rates. The UK Hinkley Point C CfD approach has been discussed in METI reports as a potential contract approach. Electricity market rules, electricity industry structure, national laws, and other constraints will determine which of these approaches to nuclear revenue certainty are possible. A power contract approach also requires a creditworthy counterparty. Most of the approaches look to electricity consumers as a source of revenue certainty, similar to the traditional electricity industry model. The role of regulators (e.g., as in Iowa) or government (e.g., in Ontario and the UK) will be important.